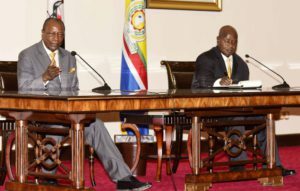 President Museveni (right) receives President Conde of Guinea. Courtesy photo. 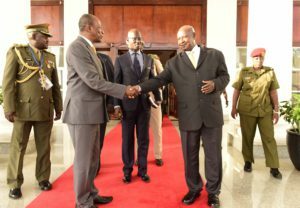 President Museveni has commended President Alpha Conde of Guinea who also doubles as Chairman of the African Union for his efforts aimed at accelerating the implementation of strategic issues of high importance to Africa. “We have had talks on various issues in Africa. Also Guinea is a valiant and proud African country with rich natural resources ” he said. President Museveni, who held a bilateral meeting with his guest shortly before addressing a joint press conference, urged African leaders to shun sectarianism, which he said aggravates conflicts on the continent.President Condé, who is on a two-day State visit to Uganda, said African leaders need to get united and speak with one voice. “We need to take charge of our own affairs. When we are united, we win. You don’t have to be super intelligent to know that the problem facing Africa is interference in its affairs,” he said. Guinean President Alpha Conde addresses journalists as President Museveni takes notes. President Conde said with a new dynamism in Africa, the continent will realize its vision. ‘Our champion for reform is President Paul Kagame while President Museveni is one of our champions in charge of political integration,” he said. President Conde said they have already established the African Renewable Energy Initiative Agency to push access to cheap energy and more recently united as a continent to support an African to the World Health Organisation. Dr Tedros Adhanom Ghebreyesus from Ethiopia is due to assume office on July 1, 2017. “I am here to consult President Museveni ahead of the upcoming AU summit,” he said. President Museveni is the current chairman of the East African Community. “My visit is to show admiration and support what President Museveni has done for Uganda. I always admire him for his frankness and courage of speaking his mind even when it does not please others,” President Conde said. President Conde said during the summit, they would discuss various issues including conflicts in Libya, DR Congo, South Sudan and Mali, including the continuous occupation of UN forces in the DR Congo even when there is no progress. “President Museveni is focused and has the ideology. We want to use that to be able to deliver with our new vision,” he said. Guinean President Alpha Conde being entertained on arrival at Entebbe International Airport. On the situation in Libya, President Conde said AUs goal is to stop the crisis. “It’s not easy but it has got to be done. We must find a solution. It’s like a cancer, if we don’t solve it, it will spread to the rest of Africa,” he said. On the issue of African countries pulling out of the ICC, President Conde said it is not individual countries deciding but rather the AU bloc. “ICC only targets African leaders. We can’t accept that any longer. Majority voted to withdrawal but we also can’t support impunity that is why we want an African court in place,” he said. Conde said they will also not allow any country to be isolated. “Three weeks ago, I was in Sudan to show support of AU to Bashir. Is it an International Criminal Court or is it a court against Africans,” he said. On the issue of a refugee fund for the AU, Conde said the fund is not practical but rather leaders should work towards stopping causes of conflict.